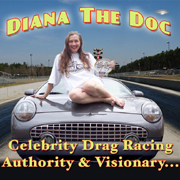 THE MOST READ FEMALE BLOGGER ON THE DRAG RACING INTERNET. THANKS TO YOU. I LOVE Y'ALL FOR THAT!